In this blog post I would like to share with you the experience of business leaders who deliver excellent customer service and listen to their customers. Your customers don’t care how much you know until they know how much you care. Listen to the customer and invent for the customer. At Booking.com putting the customer at the center of everything done by the company is one of the most valued principles. They actually realize that real people interact with their products and thus they want these people to love their experience with Booking.com. Online survey tools. In fact, this is the most popular and convenient way to collect feedback from customers. Street level user testing. Though it may sound unusual, Booking.com employees talk to people outside their office and ask questions about their service. Usability tests. During these tests customers follow their natural behavior while the session is being recorded and guided by a moderator. User research. It gives an opportunity to observe customers using the product for extended periods. Diary studies. It’s a form of a long-term research with the same participants. The participants write entries with their activities, their thoughts and frustrations they face along their journeys. Zappos says that the number one tool any company can use is listening. They “respond to every single customer inquiry, whether it’s via phone, email, live chat, Twitter, Facebook, Zappos blog, etc.” In fact, many of Zappos improvements are inspired by their customer feedback. Happy employees mean happy customers. Zappos provides great experiences both internally and externally. Brand’s company culture ensures employees are happy and as a result they use those same values to take care of Zappos customers. It’s all about service. Great customer service is in fact an integral part of Zappos culture. Listening is the number one tool. What is important to customers becomes also important to Zappos. No doubt that there is no need to go above and beyond to wow your customers. Just listen and don’t follow a script. Each customer inquiry is unique, just remember that. The word of mouth drives customers to be your fans. Great customer service leads to positive feedback shared across various social media platforms. Therefore there is nothing more important than happy customers telling about their great experience with a brand. Know who your customers are. Never treat them like an amorphous mass of consuming activity. In the first place remember that each customer is a human being. There is a real person behind any credit card number, online purchase and positive or negative feedback. All successful company leaders have a clear understanding of their customers. No matter how exceptional your product is, if it does not fit the needs of the modern buyer, your business will never succeed. 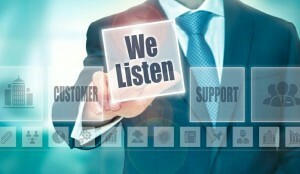 If we listen to our customers, they will tell us everything we need to know to develop the right products and services. Understanding of customers is the foundation of an organization’s vision and strategy. The more we listen to our customers the better we understand their needs and this in turn helps us to build successful business. How do you listen to your customers? We’d like to hear your tips. This entry was posted in Articles and tagged customer experience lessons, how to listen to customers. Bookmark the permalink. If you now start to search the Internet for something about the target audience, then there will be many complex terms and definitions. Thus, it may seem that research of the target audience of the site is very difficult. That this option is available only for large companies that can order serious research.